Legendary NASCAR driver Jimmie Johnson and Ally revealed the new look for the No. 48 Ally Chevrolet this morning, unveiling a blend of Ally’s unique branding along with Johnson’s iconic number and color. In October, Ally, a leading digital financial services company, announced that it would join Hendrick Motorsports as the whole-season primary sponsor of Johnson’s team in 2019 and 2020. The sponsorship will feature Ally on the champion driver’s cars throughout the full 38-race NASCAR schedule, beginning with February’s 2019 DAYTONA Speedweeks and the 61st running of the DAYTONA 500. 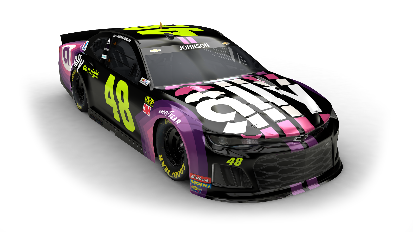 Johnson, who is signed with Hendrick Motorsports through 2020, selected a black gloss as his base color with matte decals in Ally’s color pallet. Johnson’s iconic neon yellow 48 will anchor the car. One of Johnson’s most-avid fans was on hand for the reveal in New York at the GMA studio. Johnson and Ally teamed with Make-A-Wish® to surprise 10-year-old Trevin of Florida, by flying him and his father, an armed services veteran, to New York for the car reveal and revealing that his wish to attend the DAYTONA 500 would come true. Trevin, who has cystic fibrosis and is a big NASCAR fan, will attend the race as Johnson’s guest.